^ 2.0 2.1 Silve, Dee Unglaub. Human Physiology: An Integrated Approach 6th. Glenview, IL: Pearson Education, Inc. 2013: 850–890. ISBN 0-321-75007-1. ^ Sherwood, Laurelee. Human Physiology: From Cells to Systems 8th. Belmont, CA: Cengage. 2013: 735–794. ISBN 1-111-57743-9. ^ Widmaier, Eric P.; Raff, Hershel; Strang, Kevin T. Vander's Human Physiology: The Mechanism of Body Function 12th. New York, NY: McGrawHill. 2010: 555–631. ISBN 0-077-35001-4. ^ The National Women's Health Information Center. What is a typical menstrual period like?. U.S. Department of Health and Human Services. November 2002 [2005-06-11]. （原始内容存档于2015-06-26）. ^ David L Healy. Menorrhagia Heavy Periods - Current Issues. Monash University. 2004-11-24 [2013-11-10]. ABN 12 377 614 012. （原始内容存档于2013-10-16）. ^ Stern K, McClintock MK. Regulation of ovulation by human pheromones. Nature. 1998, 392 (6672): 177–9. PMID 9515961. ^ Adams, Cecil. Does menstrual synchrony really exist?. The Straight Dope. The Chicao Reader. 2002-12-20 [2007-01-10]. ^ Navarrete-Palacios E, Hudson R, Reyes-Guerrero G, Guevara-Guzman R. Lower olfactory threshold during the ovulatory phase of the menstrual cycle. Biol Psychol. 2003, 63 (3): 269–79. PMID 12853171. 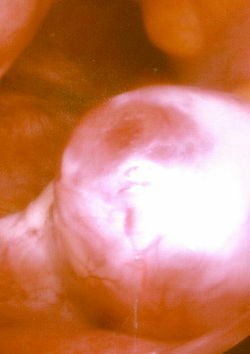 ^ Ball M. A prospective field trial of the "ovulation method" of avoiding conception. Eur J Obstet Gynecol Reprod Biol. 1976, 6 (2): 63–6. PMID 985763. ^ Dr Evelyn Billings & Ann Westmore. Trials of The Billings Ovulation Method (PDF). 2005 [2005-11-03]. ^ Sinha G, Sinha A. A field trial of Billings' ovulation method for spacing and limitation of birth. J Indian Med Assoc. 1993, 91 (10): 255–6. PMID 8308307. ^ Cohen S. "Melatonin, menstruation and the moon" Townsend Letter for Doctors and Patients, Feb-March, 2005. ^ Lacey, Louise. Lunaception: A Feminine Odyssey into Fertility and Contraception. New York: Coward, McCann & Geoghegan, 1975. ^ Cutler WB. Lunar and menstrual phase locking. Am J Obstet Gynecol. 1980 Aug 1;137(7):834-9. PMID 7405975. 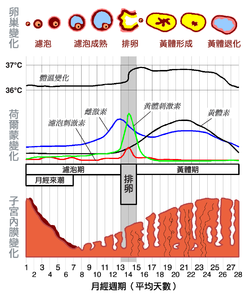 ^ 28.0 28.1 蔡永杰. 當小紅來報到：了解月經、和生理期和平共處. 青少年／女避孕與保健新知. 台灣婦產科醫學會. [2019-01-05]. ^ 31.0 31.1 吳燕秋(Yan-Chiou Wu). 眼見為真－戰後台灣婦女驗孕史（1945-1990s）. 女學學誌：婦女與性別研究. 2014-12-01, (35): 1–52 [2019-01-05]. doi:10.6255/JWGS.2014.35.1.